February 27, 2015 - "Press Releases"
With wood being one of the few renewable resources, its use continues to grow. But the automation of processing the raw material comes with its own challenges. By their very nature, wooden logs are inconsistent in size and density. Although converting tolerances are much larger than metal or plastic components, it's this variation that presents problems in high speed automated processing. A customer of ours presented us with a problem they were having with their automated de-barking machine. The basic design included a large number of rollers and cutters that sheared the bark off raw logs. All the rotating elements were connected by a series of shafts and belts driven by a main drive element. The problem they were experiencing was that on occasion a log would be misaligned or become jammed in the rollers or cutters. In these instances all the power from the main drive, as well as the inertia from the other rotating elements, would be inherently directed to the problem area attempting to drive through the jam. This resulted in broken cutters and feed drive elements as the components were only sized, with a finite service factor, to handle their individual workload. But even more costly was the production downtime. The entire process had to be shut down for hours while the affected area was disassembled and components replaced. The customer was looking for a way to detect these overloads and reduce downtime risk. The key was to develop a solution at the point of each production element. The main drive could supply as much power as necessary, so an electronic option would never recognize an overload. We suggested the integration of mechanical torque limiters at each individual station. This would allow the disengagement of the drive components eliminating the possibility of their damage or destruction. We had several actuating designs for their consideration. While the ultimate design would have been our version with a disengagement detection ring, which could have been monitored by a proximity sensor, it was deemed unworkable because of the lack of electrical access. Without a timely shut down, this model could become damaged itself. Therefore, we selected our full disengagement model. While this required a manual re-engagement, it allowed the operator enough time to shut down the process before damaging the feeder, cutter, or the torque limiting components. We were able to provide this torque limiting design in both shaft coupling and pulley hub versions, which allowed the customer to integrate them in the areas of easiest accessibility. The result was a virtual elimination of damaged and broken components and a drastic reduction in downtime as only time to clear the jam was required. Many machine designers consider torque limiters, or safety couplings as they are also known, to be an expensive luxury, preferring to limit torque electronically through the motor controller. Unfortunately, by the time the control system senses an overload, typically due to increased amp draw, the damage has usually already occurred. The costs of lost productivity, rather than the mere protection of drive components, should be considered more seriously. This often has a higher value than the components needing replacement. 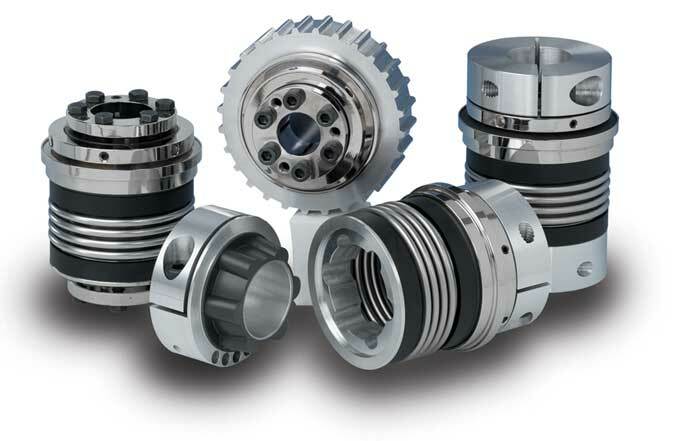 DieQua offers a wide range of torque limiting designs for a variety of applications. Configurations include pulley and gear hubs as well as coupling designs with either stainless steel bellow or elastomer insert flexible elements. Actuation designs include single position re-engagement for timing applications, utilizing either auto or manual re-engagement, multi-position re-engagement for quick re-setting, and a load holding version, which allows overload detection without releasing the load. All these models are field adjustable for modifying torque sensing values. Additional designs include an economical version that is preset at a given torque level but allows a large number of disengagements. This was developed to be an improvement over competing friction torque limiters that lose some effectiveness after each disengagement due to friction pad wear. Another series is made of lightweight but super strong materials for low inertia, important in servo applications. When looking to reduce downtime and increase the safety of your manufacturing process, contact DieQua to help select the mechanical torque limiting device most appropriate for your application.